This bowl is so pretty! 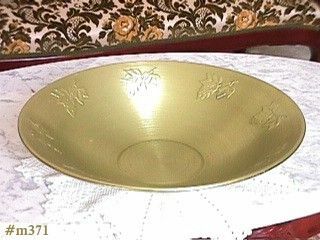 Aluminum bowl measures 14" diameter and is in a green/gold color (difficult to describe), it has leaves with grape clusters pattern (8 of them) that go around interior of bowl. Marked on bottom: A Product of West Bend Aluminum Co, West Bend, Wis, U.S.A.
Bowl has light "use" marks -- nothing detrimental.